These beautiful scarves are handpainted in a centuries-old Japanese technique, being explored anew in Northern California: the art of Arashi Shibori. Silk is folded and wrapped around a core, then scrunched to make a pattern of mountain-and-valley folds. The manipulated silk is then hand painted with dyes, the palette of colors mixing further in the brushstrokes and in the drying process. Heatset to be colorfast, the scarves are then given a final rinse, and ironed. 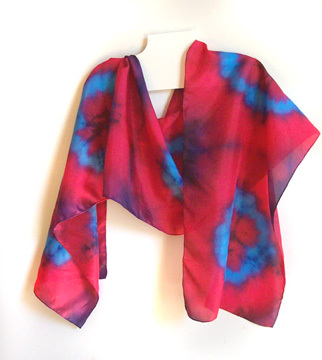 Hand-painted Silk, 15" x 72" - Shibori folded and core-wrapped habotai scarf, red, blue, violet silk chiffon. I honor those who come before me by choosing the best materials to work with. 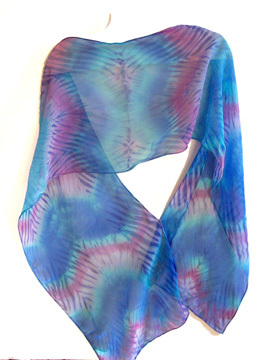 The scarves shown here are Habotai Silk, known for its shimmer, and Silk Chiffon, which is beautifully light and transparent; both in a 15" x 72" size, 8mm, with hand-rolled edges. 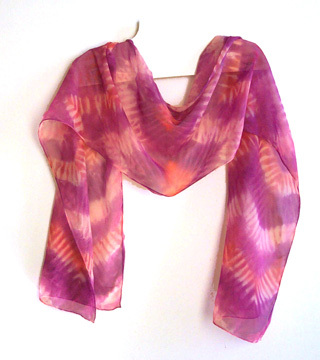 The dyes are steamed or heatset to be colorfast and the scarves are hand-washable or may be run on a gentle machine cycle. Hang to dry; a medium iron is okay. Ironing while damp is the best way to get all the wrinkles out. Be aware that hanging your silk in bright sunlight will age your silk prematurely. 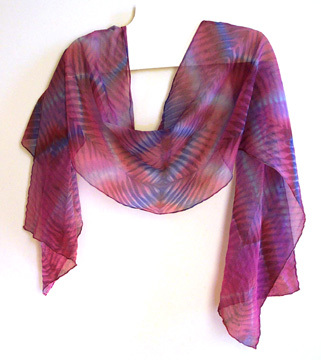 Please note that Woolite(tm) is NOT recommended for silks, as it is hard on the fibers. Prices are noted for each piece. California orders please add 8.50 percent sales tax. Insured shipping and handling in North America is a flat rate based on weight and applied by cost. Wholesale and gallery inquiries are welcome. If you like something that you see here and would like to order something in a similar set of colors, please inquire and expect up to a four-week turnaround. Each item I make is unique, it is part of the wonder and delight of this art form that no two pieces can possibly be alike. Any purchased item may be returned for full credit of the item cost with tax; all you risk is the shipping. Please be aware that even the best of digital photography and image transmission over the 'net is not an exact science: I've done my best to shoot and display the truest colors, but nothing can quite capture the luminesence of the silk in your hands, and different monitors are calibrated differently and this affects how you will see the colors. Contents have been created, developed, written, photographed, html-coded by hand, and are copyright (c)2002-2012 by Ruth Temple.